Ik creëer kaarten. But I don't speak Dutch, unfortunately. I would be happy to create a map, or to translate one of my completed maps into Dutch with your help. Please visit my Commons or my English page. Babylonië, 1792 - 1750 v.Chr. The empire of Attila the Hun, circa 450 AD. The Republic of Venice in 1796. The domains of the Golden Horde in 1389 before the w:en:Tokhtamysh-Timur war, with modern international boundaries in light brown. 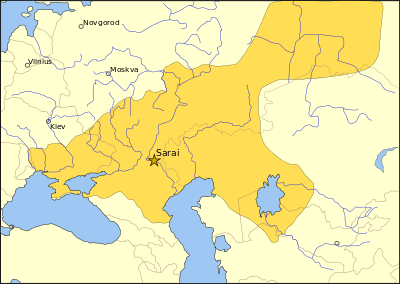 The Principality of Moscow is shown as a dependency, in light yellow. Deze pagina is voor het laatst bewerkt op 19 apr 2009 om 13:11.